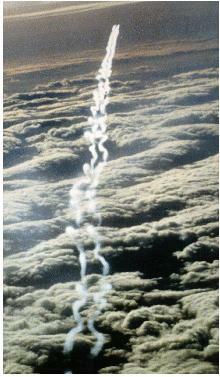 A view of a contrail being formed as seen from above and behind during the European Union's POLINAT project in 1997. The turbulent wake formed by the aircraft's passing causes the contrail to ripple over time. Contrails have been known since before World War II, when high altitude flights became possible. They were first scientifically described in English in the research of H. Appleman, The formation of exhaust condensation trails by jet aircraft, Bulletin of the American Meteorological Society, 34, pp 14-20, 1953, or earlier, but in German, by Schmidt, E., Die Entstehung von Eisnebeln aus den Auspuffgasen von Flugmotoren, Schriften der Deutschen Akademie der Luftfahrtforschung Vol 44, pp 1-15, 1941. If temperatures are low enough, generally below -38C, the contrail will form into a linear shaped cloud of ice crystals at which time it will behave almost identically to other cirrus clouds, which are also composed of ice crystals. Once the contrail forms, it's lifespan is almost completely dependent on the quantity of moisture in the air parcel in which it exists. If enough moisture is not already in the air the contrail forms in, the contrail will rapidly evaporate(sublimate). If the air is supersaturated with respect to ice, the contrail ice crystals can persist the same as other cirrus clouds, and if enough moisture is present, the ice crystals can grow through deposition via the Bergeron Process. The contrail, if existing within a region of upper level winds, can also spread out and grow due to wind shear. If the crystals grow to sufficient size, their size can result in their beginning to fall to lower altitudes. - Wispy appearance with the typical "Mare's Tail" effect, within contrail circles the terms 'fishbone' and 'cobweb' have also been coined. This appearance, also present within natural cirrus clouds, has been falsely claimed by 'chemtrail' proponents as abnormal when in fact the onset of cirrus clouds is a long-known, albeit primitive, form of weather forecasting preceding a frontal system. - Refraction and prismatic effects caused by the ice crystals which lead to division of the sunlight spectrum into it's visible colors, so that colors and halos become visible in the contrails/cirrus clouds. These optical effects, known to exist for centuries, have been falsely claimed by 'chemtrail' proponents to be due to oil or chemicals. -Contrails "stopping and starting" is due to the airplane flying through varying air parcels which either allow them to persist or not. It has been claimed as evidence that these contrails are "spray" being controlled. In fact, at all levels, our atmosphere is often a chaotic mix of rising, falling, moving, and varying moisture levels. All have seen how normal clouds can vary in shape, location, and have at one time seen a totally clear sky with only one singular cloud in evidence. This observation clearly shows that the air we see differs widely from one point to another, and fully explains how contrails can start and stop depending on the air they are in. -Contrails in parallel or intersecting shapes are due to aircraft following corridors or passing near waypoints, which are the imaginary "roadways" and "intersections" in the sky that planes use while in flight. These are normal, expected, and can be monitored at home with your PC using a new software program which allows realtime access to air traffic control views of the sky nationwide, at low cost. The claim that patterns formed by contrails are an indication of a sinister program is not supported since all these patterns are known to result from normal traffic patterns. One last way that contrails can form is when airflow across a wing is sufficient to create a turbulent eddy in which a low pressure forms. As the pressure drops, atmospheric moisture cannot be contained and it condenses. These vortex trails have been known to exist and are considered normal, especially on wingtips, but under high moisture conditions can form at other points where air turbulence takes place. 'Chemtrail' promoters have seen these and noted they do not come from the engines, have falsely claimed them to be a "newspray" system, when in fact all pilots know they are normal. Back to Contrails, or 'Trails-Con?